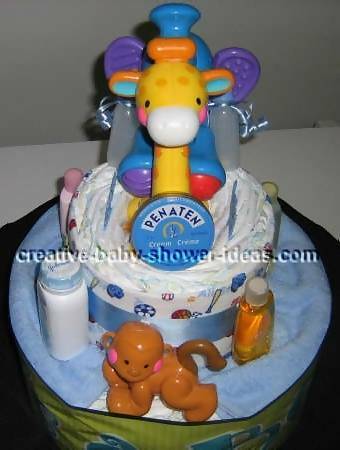 Welcome to the largest baby diaper cake gallery on the web. 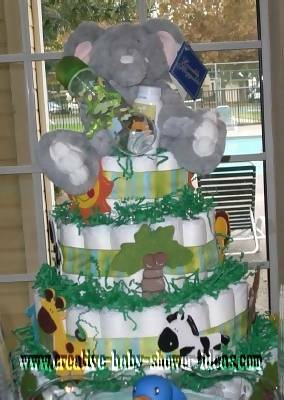 Our gallery has tips and ideas compiled from our readers to help you make your own diaper cake masterpiece. 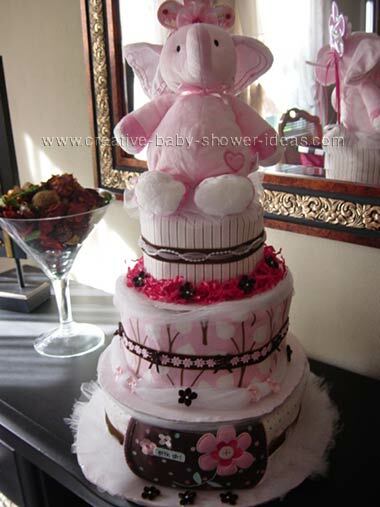 To see other styles of diaper cakes in our gallery, visit the diaper index link below. Enjoy! 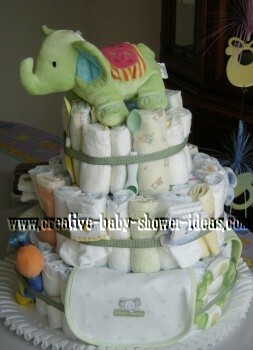 I made a diaper cake for my elephant loving friend. Her favorite color is green so many of the accents were in that color. It also worked out well since the baby's gender was unknown! 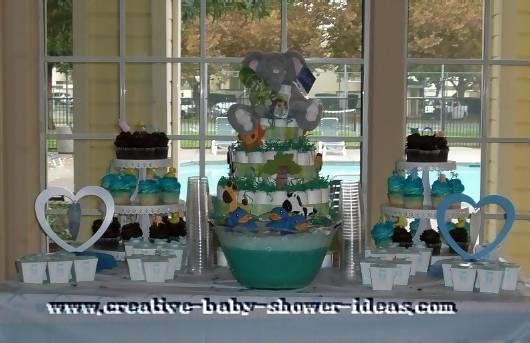 The cake was made of size 2 diapers, 3 bibs, 3 spoons, 1 rattle, 1 elephant topper, 4 pairs of baby socks, 4 burp clothes, and 4 wash clothes. 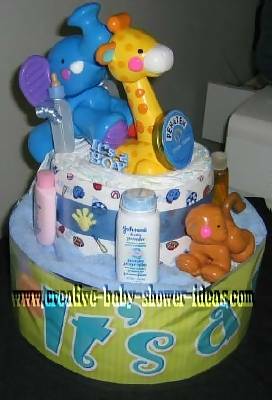 We used this diaper cake for our greatest show-er on earth (circus) themed shower. We had animal crackers as favors, made a card table into a big top for presents, that's why the clowns are on cake. 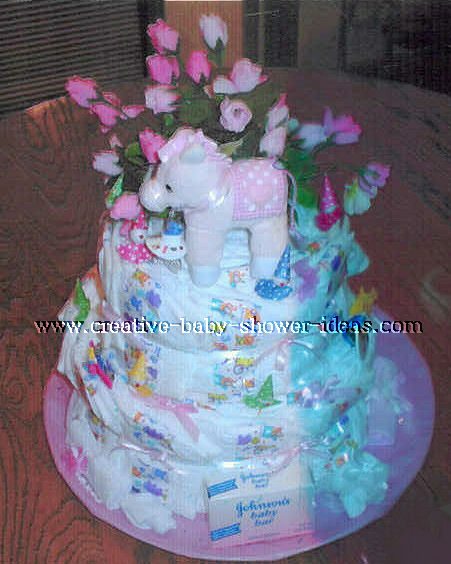 After checking out your website I was inspired to make my own diaper "cake". I have pictures that I would like to submit of how it turned out. I used size 4 diapers. I got the ribbon from Michaels, stuffed elephant from Walmart, wooden cutout from Michaels, and baby bottle from the dollar tree. Line the bottom of the box with felt. Place the baby blanket inside the box. Roll and tie 15 diapers with ribbon. 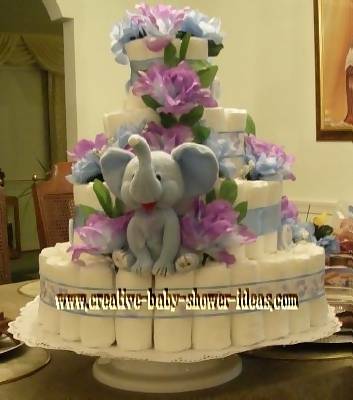 Place the 15 rolled diapers inside the plastic cake cover. Place it inside the large box. Line the bottom of the plastic cake cover with ribbon (navy blue, gold, red). Cut out letters for the word "CIRCUS" in capital letters using navy blue, green and red felt. 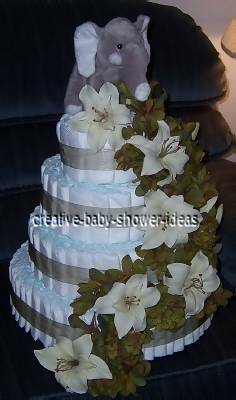 Attach with glue gun to outside of plastic cake cover above the three bands of ribbon. Place the clown figurine in front of the plastic cake cover. 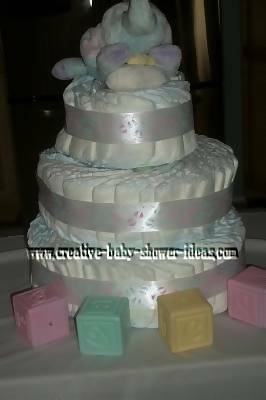 Place 40 rolled and tied diapers around the plastic cake cover. Place the felt horse inside the box. Roll and tie the wash towels with ribbon and place them in the large box. 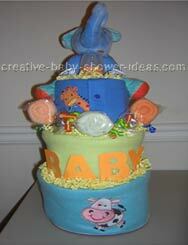 Place the carousel on top of the plastic cake cover. 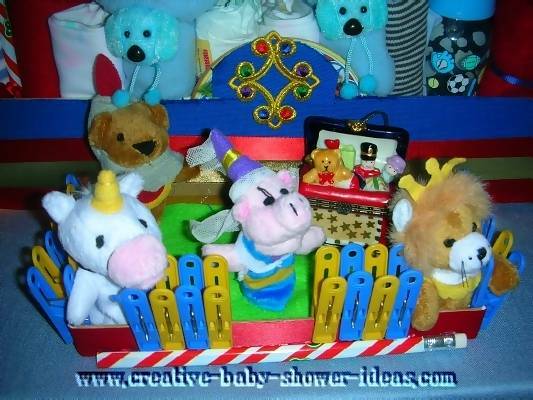 Place the baby doll in tub in front of the carousel. Place two soft sport balls (blue soccer ball/baseball) near the baby doll. 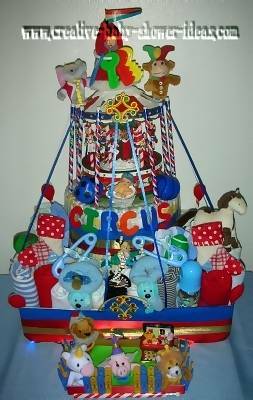 Crown the carousel with 1 rolled and tied diaper and cover it with a red felt cap. Place the baby rattles around the cap. Place 2 finger puppets on both side of the rattle. Glue a clown figurine with flag to the hat. Place 11 candy striped pencils around the carousel. 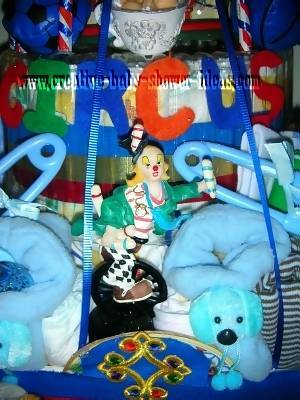 Stretch blue ribbons from the top of the carousel to the top of the large box. 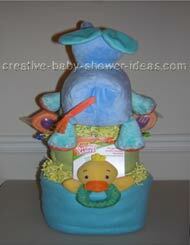 Place small stuffed animals, baby bath toys and any items of your choice inside the box. Line the bottom of the box felt. Line the edges of the box with red ribbon. Glue one candy striped pencil to the front of the box. Line the sides of the box with the plastic clothespins. Place four of the finger puppets inside the box. Place other knick-knacks of your choice inside the box.